Data Rant: is attack the best form of defence? David Moyes’ defensive outlook at Manchester United failed to bear fruit despite the adage that ‘defence wins championships.’ Even with the Scot’s obvious emphasis on conservatism, Moyes’ Reds failed to better his old club, Everton, in terms of goals conceded last season. 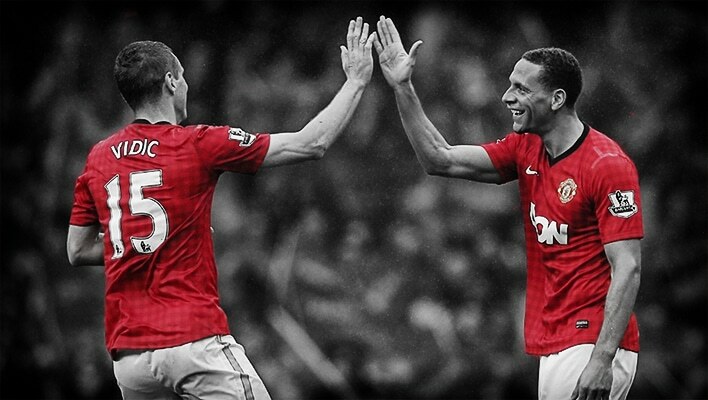 United’s back-four is set to be reconstructed this summer after Nemanja Vidić and Rio Ferdinand left the club. Data Rant examines United’s rear guard… and looks to a future under Louis van Gaal. 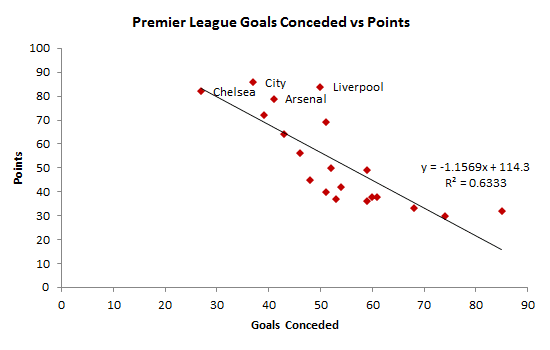 First, it comes as no surprise that fewer goals conceded leads to more points gained in the Premier League. Curiously though, it is hard to distinguish one team from another in terms of defensive statistics, below. Apart from Chelsea, where José Mourinho’s side made far fewer tackles, it is hard to point to a trend purely from the data. Key passes is one proxy for attack – and are by definition threatening to the opposition. There is a fairly strong trend between assists and goals conceded, below. That is, more assists – as a proxy for attacking – means a more secure backline. 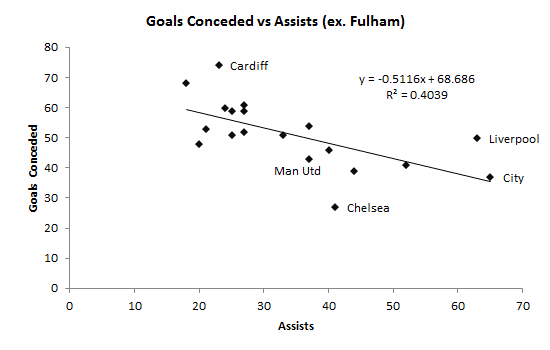 Fulham is a clear outlier in this analysis. 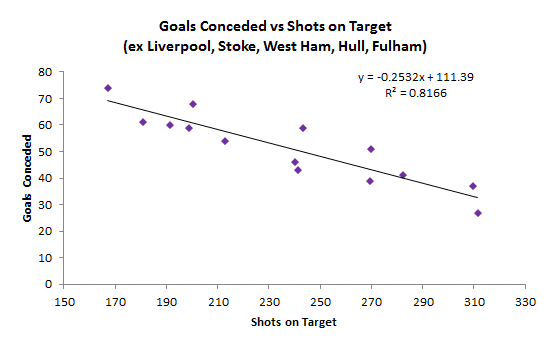 Along with Liverpool and Manchester City, Fulham is one of three clubs that scored more than 10 goals from corners. 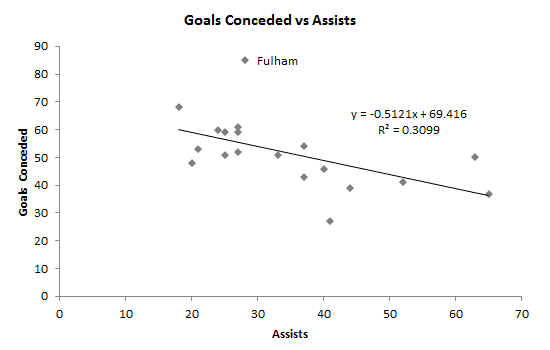 The London side’s goal figure is significantly distorted by this focus on dead ball situations and Fulham’s removal from the dataset makes clear the correlation, below. While intuitive, it is far too precarious to assume that attack is the best form of defence just yet. Too much commitment in opposition half can backfire – accuracy therefore must also be accounted for. Shooting is also a good measure of time spent in advanced areas. We use not shooting accuracy, but the number of shots on target to make sure that the time each team spends in the opposition half is accounted. The number of shots on target is the a good barometer of a team’s collective attacking ability – a good playmaker will consistently line up better passes than a mediocre one, while a great striker will simply finish better. If attacking is positively related to defending then accuracy will have a strong relationship with goals conceded by each team, below. A solid, yet inconclusive, trend appears when the number of shots on target by each Premier League club is compared to goals conceded. Fulham again stands out, but so do four other clubs. The cluster to the bottom left of the chart below – Stoke City, Crystal Palace, Hull City and West Ham United – points to four teams sacrificing attack for a solid defence. Each managed to stay in the Premier League. In fact, apart from West Ham, each improved from the season before. Liverpool, on the other hand, could have let in far fewer goals judging by performances of other clubs in this data. Brendon Rodgers’ attacking approach, however, has put the Merseyside club back in the Champions League. This brief study has demonstrated a potential causal link between attack and defence. Something to note when considering the significant headache United faces with Ferdinand and Vidić no longer in the squad. Palace may have finished 11th with a solid defense, but Liverpool’s approach took the club into Europe. It is, therefore, clear which approach United ought to replicate. van Gaal’s Netherlands defeated Spain 5-1 with intensity and not solidity, for example. The axes were labelled correctly as far as the data on the graph is displayed. 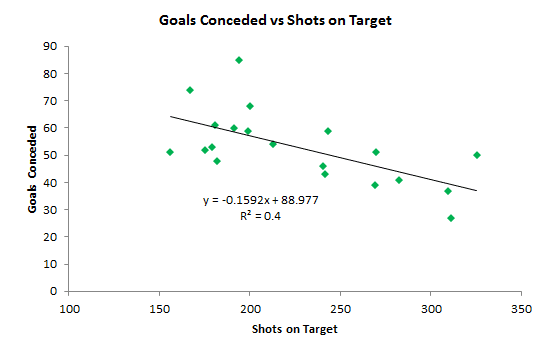 Just happened to show ‘ goals conceded’ as a horizontal axis rather than as a vertical one, as in the other graphs. i wonder what Sir Matt would have made of such an in-depth statistical analysis of attack and defence. In their last two games before the Munich aircrash United won 5-4 at Highbury against Arsenal, and drew 3-3 in Belgrade against Red Star, having been 3-0 at halftime (to win 5-4 on aggregate). Looking back at the United team of the 60’s, it’s not hard to imagine what Best, Law and Charlton’s view of attack and defence would be. Go out and score more goals than the opposition was their cunning plan. Didn’t always work but it was exhilarating to watch. The 1965 championship winning team won on goal average (pre goal difference where goals for were divided by goals against) over Leeds that were notorious for 1-0 wins. Goal average favoured fewer goals against than goal difference. And United had a one season wonder keeper in Pat Dunne from Ireland. Very true SS, in fact if think if you go back to circa the 1948 team, you will find that attack , and scoring golas was the success of the team in a period of 5/6 years. If you then look back over 70 years, when the team has enjoyed enormous success it has always been when we have had an attack minded team, coupled with superb wingers. Delaney/Morris 1948ish, Pegg/Scanlon/Berry 1956ish, Best/Connelly 1965ish, we then went AWOl for a few years !! Kanchelskis/Giggs1993ish and Mr Beckham who although not a winger was rather effective on the right . Now fellas I know I have missed a few. Help me out ! Whilst the 1970’s were hardly vintage years, the latter part of the decade saw some entertaining wing play from Steve Coppell and Gordon Hill. Great insight! Although I do not disagree with your conclusion, I have some comments…..Teams with bigger budgets, hence better individual players will likely always have the best defence and attack (Utd, city, Chelsea etc). A better case would be to do the same analysis with a sample set of teams that have a similar avg budget year upon year.